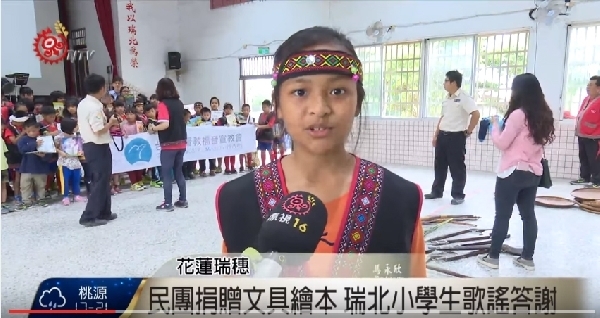 To express the gratitude for the stationary and book donation provided by the local charity organization, the Ruei Bei Elementary School students sang the traditional aboriginal songs in return. “I am really happy about receiving the books, and hopefully when I grow up, I can help poor people, ” said Yong Shin Ma, a Bunun tribe student. “Thank you for donating the books; I hope to become someone like you when I grow up, ” said Panay, an Amis tribe student. There are 89 students of mostly indigenous Bunnun and Amis tribal background in Ruei Bei Elementary School and Kindergarten. Even though libraries are available, the school authorities hope to increase and update the book inventory to current old ones. “Today, I'm really appreciative of all the public resources and expect our pupils to support others when they are able to, ” said Bing Ren Zen, the principal of Ruei Bei Elementary. “Our Taiwan Christian Gospel Mission hosted a family sports event for approximately 600 students and parents in total. We also have a festival to collect charity donations of the household items provided by participants,” said Pastor Kanyu, a CGM pastor from Amis tribe. This is the first time for CGM to arrange the charity sports event and spread the love to rural areas by collecting nearly 400 books. They are aiming to collect more picture books and stationary in the future to increase the reading opportunities for the pupils that lack of reading resources in rural and remote schools.